Mediaplanet’s Sleep and Wellness campaign, found online and within USA Today, raises awareness on some healthy habits and supplements to live a healthier life. 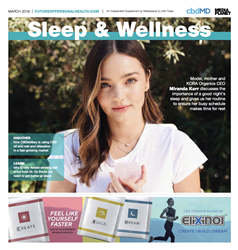 Helping to conclude Sleep Awareness Week and kicking off World Sleep Day on March 15, 2019 Mediaplanet today launches the first edition of “Sleep and Wellness.” This campaign advocates for the increased awareness of health issues resulting from poor sleep and the healthy habits that can increase sleep quality and well-being. This campaign will educate an audience of young adults, parents and industry executives on the need to prioritize sleep, no matter the age or stage of life, along with the easy changes that make sleep and wellness. Insufficient sleep is a problem that plagues more than a third of adults. In the campaign, Dr. Mehmet Oz shares that lack of sleep is “the single most underappreciated problem we have in America.” This campaign explores different ways to encourage sleep: from understanding Ayurveda, perfecting the sleep environment, finding tools such as meditation to ease stress and using supplements for holistic health. CBDistillery teams up with mixed martial artist champion and busy mom Michelle Waterson to discuss how she finds balance, recovery and relaxation with the use of hemp-derived CBD. “Taken in the evenings, CBD, especially the nighttime CBD gummies, allows me to rebalance my body after a long day of training so I can enhance my recovery,” she says. The digital version of the campaign is live and can be read at futureofpersonalhealth.com. This campaign was made possible with the support of CBDistillery, cbdMD, Miranda Kerr, FOREO, Sahara Rose, Elixinol, the World Sleep Society, Ananda Hemp, Charlotte’s Web, Jhené Aiko, Montel Williams, IOPI Medical, Layla Sleep, Mima Kids USA, Aethics, Deepak Chopra, Dr. Mehmet Oz, Sweats and the City, Morgan Tyler, Anxiety and Depression Association of America, Cleveland Clinic, The Sleep Doctor, The Stress Detective, American Academy of Sleep Medicine, the Better Sleep Council, the American Heart Association, Mattress Advisor, Keith Cushner, Morgan Tyler and Ritual and Routine.